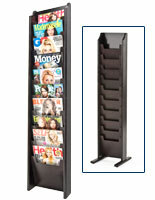 These wood magazine racks, called rotating literature stand, will bring warmth and a bit of sophistication to doctors’ offices and office reception spaces because of its material of construction. 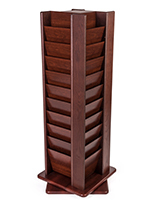 The wooden structure is a bit contemporary because of its elevated nature. 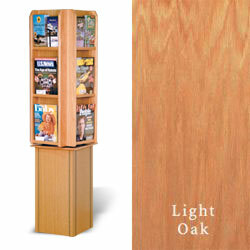 Wood magazine racks that are made of oak are typically seen in waiting rooms, schools, libraries, and many more places. 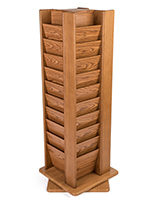 The light finish allows this unit to coordinate with many different styles of décor and varied settings. 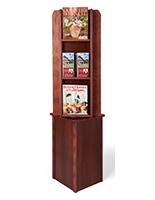 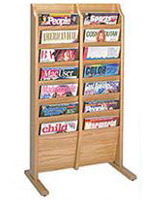 The revolving brochure holder, wood magazine racks measure 16-1/2" wide by 61-1/2" high by 16-1/2" deep and has 12 periodical-sized pockets or 24 brochure slots. 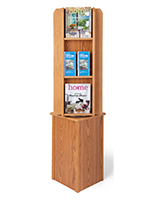 Just the top half of these structures rotate, which places materials both easily viewable and makes them simple to select. 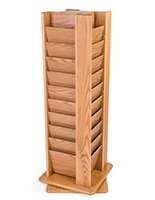 16.5" x 61.5" x 16.5"
10.3" x 13.0" x 2.0"